I had dropped my oldest son off at daycare and was driving north to take my youngest to the doctor. 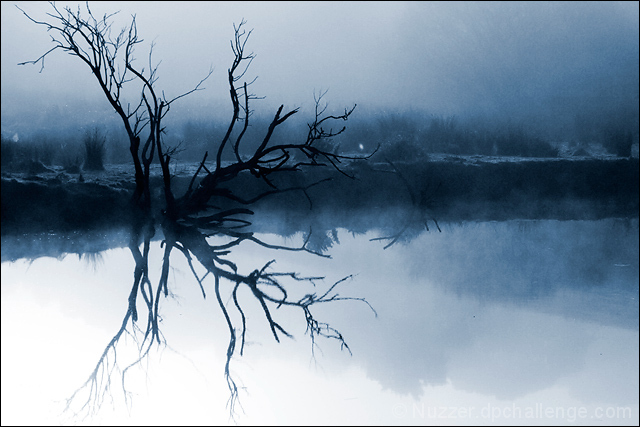 It was a very foggy morning and as I passed Puhoi I saw this tree on the rivers edge so I turned around and fired off a few shots. I like foggy mornings. Interestingly this is the second shot I've entered to DPC in a row where it was taken in full manual mode, rather than Av or similar. I rarely go into manual but it seems to be something I should do more. Its a very very wonderful image and perfectly suits the title. Excellent capture! Congrats on your 4th place finish! I thought for sure this one would be in the top 3. It is so fabulous! Glad this one did so well. Knew this would do well and so it should. Beautiful, beautiful shot. Congrats on 4th place, Gerry. Way to go Gerry. One of my top picks, gorgeous scene and tones. Congrats! Nice processing! ;-) excellent finish! love the duotone.. perfect choice for this image. Lovely. Those cool color tones and the reflection in the water if very nice. a few spots and specks to be cloned out after the challenge but apart from that this is simply wonderful. Like a water color painting. Ooooooooh. . .Good one! This is certainly one of my top picks. Proudly hosted by Sargasso Networks. Current Server Time: 04/23/2019 12:14:27 AM EDT.